I wrote this following a visit to an exhibition on in the Fruitmarket Gallery In Edinburgh. It was a visit with my creative writing group to an exhibition of Brazilian Art. The piece that impacted on me was 10 cut down black ballot boxes that held up the mirror to the lack of democracy in Brazil at that time; the artist as Antonio Dias and the date 1968. I always approach my annual trips to Windsor with great anticipation. An event to lift the grey of January, a time to have the space to think about how life is evolving and what that means for me as a leader who works with leaders too. As the taxi from the airport drops me off and I show my passport to the police at the gate the sense of something special about to happen engulfs me. As an old timer it's also time with friends to deepen connection, to laugh, to reflect. The ancient setting of course creates a connection through time to something beyond ourselves and adds to the stimulus of thinking and expression. A trip to Evensong enhances that sense of long standing traditions and rhythms of a world so different to my own. As a Scot perhaps I feel it stronger-it doesn't feel like my history-and that in turn stimulates a different understanding, an exotic twist on a remarkable opportunity to learn. What I have noticed over the years that I learn as much from the discussions I don't agree with as the ones I do. Perhaps I spend too much time with people who think similarly, it's easy to collude in our beliefs and seek out those who confirm them after all. But Windsor brings a much wider experience to my norm and I suspect that's the other part I value. The exchanges that leave me irritated, even annoyed if I'm honest with myself, are often the most valuable. Perhaps they challenge a fixed belief that needs to be prodded from time to time or its maybe that irritation helps me articulate my counter position better. It also challenges my authenticity. I look at how I might express my response constructively and how that leaves me open to learning. It is all so valuable and why so often I leave Windsor unable to describe exactly what I have learned in that moment. But that changes as my learning slowly simmers and my insights deepen. A strong theme for me and others this year was how we enable others ( and ourselves?) to move from a concept of hierarchical leadership models to ones of shared leadership. It's one I have studied of late through research into the Workplace of Tomorrow where People and Planet Really Matter. So it wasn't a new concept to me maybe but the discussion helped to affirm and give power to my belief in the need for this paradigm shift in leadership. My year ahead I know will be focused on how to to enable myself and others to achieve this in reality. I know why I prioritise this trip to Windsor every year, it's a rare gift and a special place to learn and grow. each time I think how much I would love to replicate this opportunity in Scotland too...who knows maybe this year I will. The run up to an election is an exquisitely painful time for a political anorak like me. I'm hooked too often to debates and debates on debates for it be healthy I suspect. I analyse body language, I analyse policy and savour commentary. I occasionally rage at the TV or radio, I read sections out of articles to anyone who wants to listen ( soon that may only be the dog...) and agonise over polls. But my day job is largely about enabling leadership in individuals and organisations and I find myself this election being fascinated by what we see happening in UK politics what that says about the leaders we are watching so closely. Do we look for the same qualities in our politicians as we do in other leaders? These are changing times and in an ever more connected world, where collaboration and the ability to connect with people are becoming key skills for all leaders, what does that mean for our political leaders? Has the tendency to elect heroic leaders begun to change as it has in other sectors now too? Can we tolerate the leader who hasn't all the answers, but is willing to listen, to work with others, to put people before set in stone policy, to be willing to say I got it wrong? Because there's a paradox in choosing political leaders I suspect. Our tendency to think those who lead the country need to be all knowing, to lead with a loud, strong voice, who are never wrong, to set out a direction of travel and never waver reflects the current paradigm of leadership. And yet what people most often seek in a leader of any variety is someone who is willing to be themselves, to show their humanity in an open and authentic way, to show,their values not just through words but through actions, who can relate to us with empathy and show compassion for all through their policies and plans; the kind of leader who knows that having a shared vision then enabling and motivating their people to work towards it is what gets the best outcomes. My own experience of writing this blog has helped me accept that it's authenticity we are drawn to in others, not perfection. We of course need competence, communication skills and commitment; there is no short cut to working hard on doing a good job, but without authenticity, honesty and integrity that is visible not just in public but behind doors too, our belief will flounder, our votes will remain un-cast. 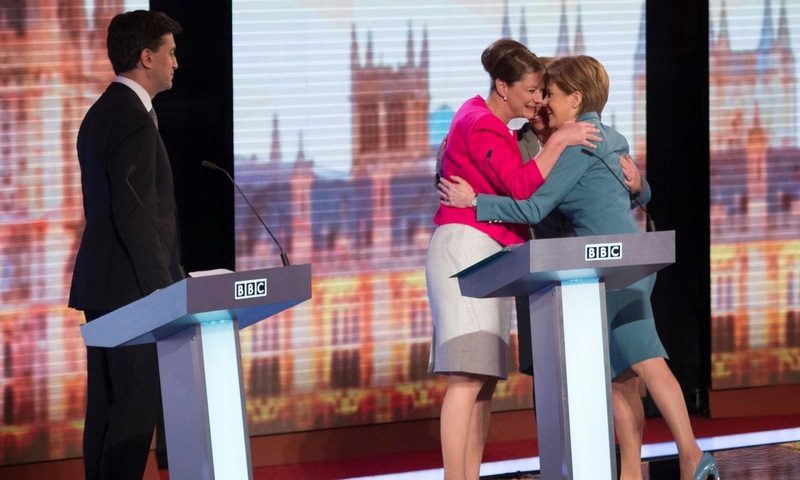 The recent leaders debate that closed with the three women of the progressive alliance in a hug perhaps was the most potent symbol of our changing times. The polls afterwards suggested Nicola Sturgeon the clear winner for her leadership style. The studio audience clearly felt the same. Do they all believe in an Independent Scotland? No. Do they all want to vote SNP? I doubt it. But they know a women in the prime of her career, well prepared and able for her role, a skilled communicator and they get her humanity and her genuineness. And those close to her will always testify to that too. The growth in SNP membership has so much to do with her style and how she reflects the kind of Scotland many want to see; smart, modern and compassionate and walking tall in stilettos too! Even if my stilettos days are gone and my answer more likely to be- the words of the song...in those shoes, I don't think so!-I'm glad I'm not alone in welcoming the women's influence in this election and my real hope is that our future lies with authentic leaders not just in our parliaments but our organisations too.